The Skoda Superb has overtaken rivals such as the Ford Mondeo and Opel Insignia in sales volume. Following a long decline, Europe's once-mighty volume midsize segment is on track for a second consecutive year of rising sales as new models from Skoda, Renault and Toyota lift the sector. 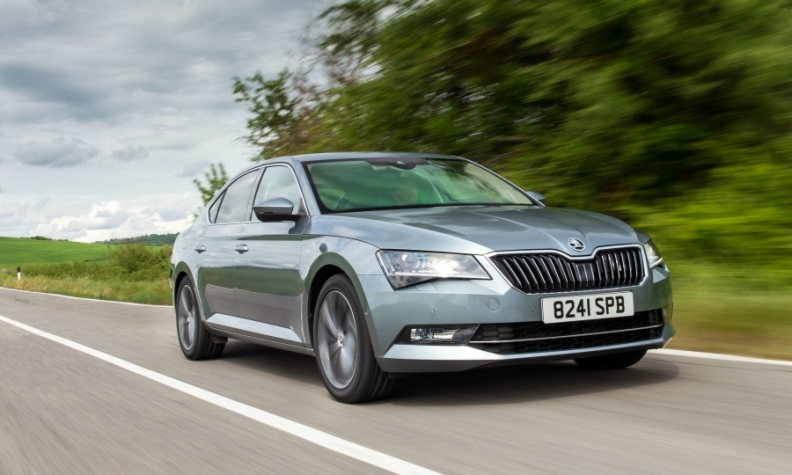 Strong demand for the Skoda Superb has sent the car's sales past the Ford Mondeo and Opel/Vauxhall Insignia to second place in the segment behind the Volkswagen Passat, which has a commanding lead over all volume midsize rivals in Europe. Meanwhile, the new Renault Talisman has entered the midsize segment's top 10 in eighth position, according to figures from JATO Dynamics, giving the French automaker a boost after years of weak sales from its former entries in the sector, the Laguna and Latitude. The success of the third-generation Superb, which was launched mid-2015, as well as a 42 percent sales increase for the revamped Toyota Avensis, are expected to push the segment's total volume to 688,000 in 2016, analyst LMC Automotive predicts. That would top last year’s mark of 630,987 sales, the best result for the midsize segment since 2012. This upward trend, however, is temporary. LMC predicts midsize sales will decline steadily to 594,000 by 2020. Because overall European sales are expected to rise, the midsize segment's share of the total European market is forecast to dip to 3.5 percent in 2020 from 4.4 percent last year. Automakers have struggled to lure customers to the segment for more than a decade. In 2000, European customers bought 1.7 million volume midsize cars, resulting in an 11 percent market share. JATO automotive analyst Felipe Munoz said there are three reasons for the segment's sales collapse. "SUVs have increased in popularity, premium automakers are now selling cheaper entry-level models, and big players such as Honda, Fiat and Nissan have left the segment," he said. More automakers are set to quit the sector. LMC believes Citroen will exit when production of the C5 ends toward the end of the decade. Citroen sold just 4,449 C5s in Europe in the first five months. Meanwhile, Toyota wouldn't confirm that it will replace the third-generation British-built Avensis, which was recently face-lifted but has been on the market since 2008. "We will continue with production as long as we can, then we will review and see what would be the best models to offer the market," Toyota Europe CEO Johan van Zyl told Automotive News Europe. "We see the movement of the market very strongly toward SUVs." Premium automakers have also contributed to the decline of the segment as 2015 was the first year that combined sales of midsize models such the BMW 3 series and Audi A4 were higher than the volume for all mass-market models (51 percent vs. 49 percent), according to JATO. Ford decided to fight back against the premium push into the segment by adding its new top-of-the-range Vignale trim line last year. The first car to offer it was the Mondeo, but the move is not paying off. In Ford’s biggest European market, the UK, sales of Vignale versions of the Mondeo accounted for about 2 percent to 3 percent of total sales six months after launch, Ford UK sales boss Kevin Griffin told Automotive News Europe. Griffin said he expected that figure to rise closer to the company's goal of having Vignale models represent 10 percent of its European sales. This will happen once Ford introduces Vignale versions of other models and increases the number of outlets where they are available, he said. Ford's effort to try to get customers to spend more on midsize models is understandable because the average a customer in the UK paid for a car in the segment in the first five months was 25,400 pounds ($32,900) according to JATO analysis. By comparison, the average premium midsize model's price was 36 percent higher and the average price for a volume midsize SUV was 26 percent higher. While overall sales of volume midsize models are down, a closer look at the segment reveals a surprising winner: station wagons. Last year midsize wagons accounted for 62 percent of the segment's overall sales, up from 33 percent in 2000, according to JATO data. Meanwhile midsize hatchbacks slumped to their lowest level last year at just 17 percent and sedans had a 21 percent share. 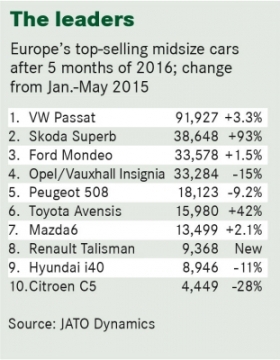 One reason for the rise of midsize wagons is strong demand in Germany, Europe's largest car market. 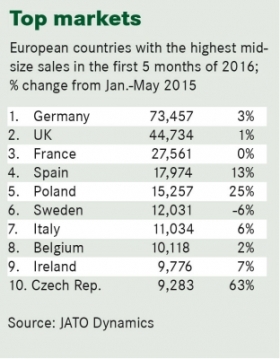 Car buyers in Germany purchase more volume midsize cars than any other country. The midsize segment is dominated by diesel powertrains, which account for 87 percent of all European sales, up from about half in 2000, JATO figures show. Automakers, however, need to gradually reduce their diesel dependence if they want to maintain or improve sales in the segment, JATO's Munoz said. "The survival of the segment will depend on automakers proposing new alternative-fuel wagons," he said. Some automakers are already doing this. Last year VW released plug-in hybrid versions of the Passat sedan and wagon. The GTE variants combine battery power with a 1.4-liter turbocharged gasoline engine. The Passat GTE wagon outsold the sedan plug-in hybrid in Europe 2,946 to 330 through May, according to JATO. Like the Passat, the Peugeot 508 diesel-electric hybrid sells much better as a wagon (857 units after five months) than a sedan (108 sales). However, because wagons are almost exclusively bought in Europe, it seems unlikely automakers will dedicate large amounts of their development cash to a regional niche that is part of a shrinking segment when they can successfully sell midsize SUVs around the world.